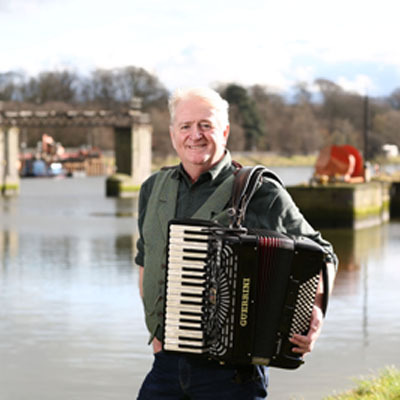 Wayfaring Stranger With Phil Cunningham combines music and history in a new series, presented by acclaimed Scottish musician, composer and broadcaster, Phil Cunningham. The three-part series is a Below the Radar production for BBC Northern Ireland in conjunction with Northern Ireland Screen’s Ulster-Scots Broadcast Fund..
Across the series, which beings on Thursday 6th April on BBC Two Northern Ireland at 7pm, Phil explores age-old musical connections between Scotland, Ulster and America and celebrates not only an extraordinary history, but a vibrant, living tradition. The migration of music unfolded over many generations and many journeys. Phil follows in the footsteps of the Ulster-Scots pioneers who brought their music to America’s furthest frontiers. The series uncovers the fascinating story of how the songs, hymns and tunes they carried with them became a corner stone of American music – country, gospel, bluegrass and rock ‘n’ roll. Phil’s journey takes him from Scotland, via the hearths and homes of Ulster, across the Atlantic and down the Great Wagon Road from Philadelphia to the Appalachian Mountains and beyond. As he traces the music, and those restless travellers who carried it with them, Phil joins an international cast of performers, helping viewers experience for themselves the power of hymns, tunes and songs that have endured for centuries. Among the artists appearing in the series are country legends Rosanne Cash and Ricky Skaggs, rising star Rhiannon Giddens, bluegrass virtuosos Tim O’Brien and Jerry Douglas, along with Paul Brady, Mairéad Ní Mhaoinigh and celebrated Appalachian singer, Sheila Kay Adams.